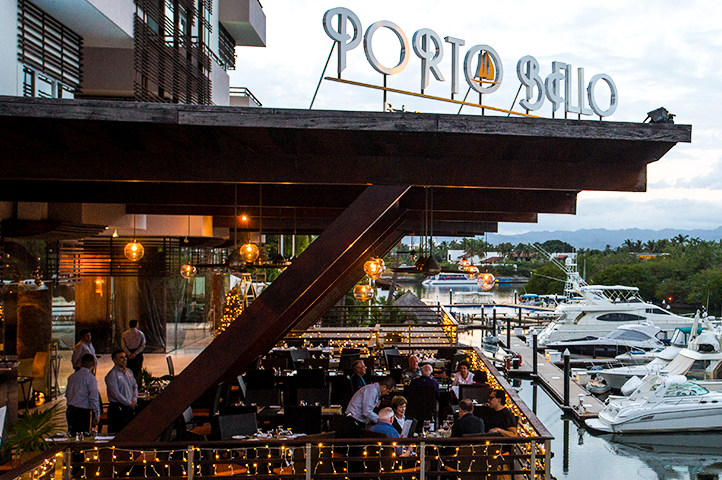 Marina Vallarta is the perfect place to spend the evening strolling along, browsing the numerous little shops, art galleries, and of course, enjoying the superb food and service of Porto Bello Restaurant. 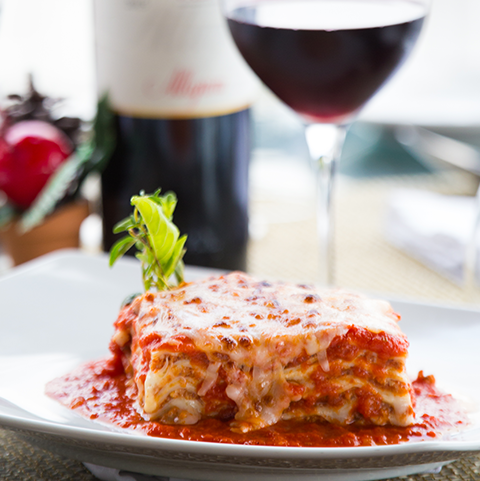 Relax and enjoy a glass of wine with your pasta, while Italian music plays softly in the background as you gaze over the Marina and the mountains that surround Banderas Bay. Maurizio Pellegrii and Mario Nunes came from Toronto for vacations and fell in love with Vallarta. 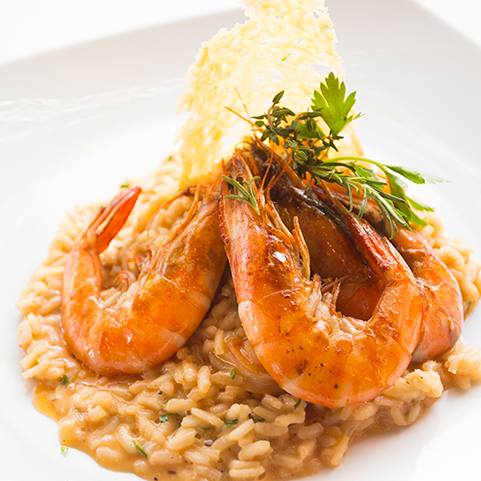 Since 1989, they have been owners of this elegant Italian restaurant, privileged with a spectacular view of the Marina Vallarta. 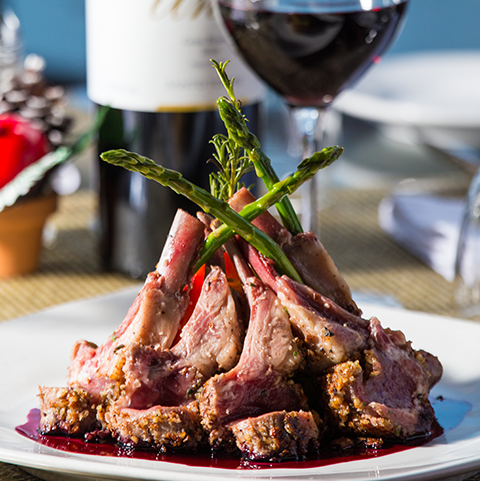 Porto Bello offers fine dining in a romantic terrace with a relaxing, neat, white setting, overlooking yachts in the Marina and the beautiful mountains surrounding Vallarta. You can also enjoy your meal in a great elegant atmosphere with soft lights of our contemporary decorated salon. Mario and Maurizio use family recipes to create homemade pastas and sauces that are featured throughout their extensive menu of traditional Italian fare. The “Fusilli Porto Bello with artichokes, black Olives and Basil is their signature pasta dish. And for lovers of veal, the Vitello Porto Bello in a white cream sauce is a must! Italian bread topped with fresh tomato, basil, extra virgin olive oil, arugula lettuce and goat cheese. Eggplant layers wrapped with prosciutto and parmesan cheese topped with tomato sauce and baked with mozzarella cheese. Tuna tartar mixed with pickles, capers Italian croutons and toasted sesame salad in a lemon scented olive oil and dijon mustard dressing. Fresh mussels sauteed with garlic, chile, tomato, basil and white wine. Caesar salad, Porto Bello style. Baby lettuce mix in balsamic vinaigrette and artichoke wedges in navy dressing with parmesan croutons. Sliced mozzarella cheese, tomato, olive oil and basil pesto. 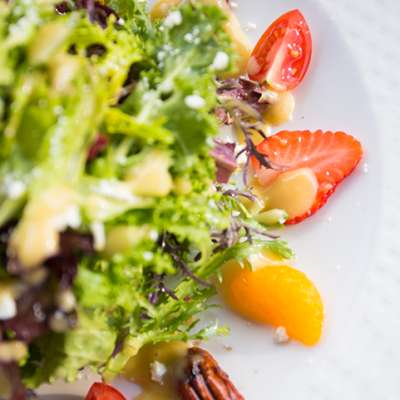 Baby green lettuce with honey glazed pecans, feta cheese, mandarine and strawberries. Lettuce, arugula, spinach, carrots and cherry tomatoes with smoked salmon and goat cheese drizzled with Basil Pesto and a touch of Balsamic Vinegar. Chargrilled whole squid seasoned with lemon and extra virgin olive oil served with a fresh sardinian style salad. Fresh seafood salad with a mix of green olives, garlic, fresh tomato celery and parsley, seasoned with extra virgin olive oil and lemon juice. Our classic italian soup, rich with vegetables & homemade pasta in a savory tomato. Delicious soup of pasta and beans in a flavorful broth sprinkled with white truffle oil and parmigiano cheese. Cream of clam soup with a touch of white wine. Cannelloni filled with ricotta cheese and spinach, baked in tomato sauce with parmesan cheese. Baked lasagna with meat sauce. Capellini pasta and baby shrimps, sautéed with extra virgin olive oil, garlic, cherry tomatoes, parsley and white wine. Fusilli with artichokes, black olives, lemon juice, garlic, basil and extra virgin olive oil. Rigatoni pasta with grilled eggplant, mozzarella cheese, oven-dried tomato and garlic. Bowtie pasta in a rosy cream, smoked salmon sauce flamed with vodka. Homemade Tortellini pasta with meat in tomato sauce mixed with mushrooms Trifolati and cream. Tricolor pasta in a light cream pink sauce with garlic, spinach, white wine, misted mushrooms, asparagus and chunks of grilled chicken breast. Creamy Italian rice with porcini mushrooms and parmesan cheese. Spaghetti with seafood in a creamy pink white wine sauce, foil wrapped and baked. Linguine with clams and baby shrimp sauteed in garlic, white wine, extra virgin olive oil and parsley. Fresh breaded eggplant, fried, then baked with cheese & tomato sauce. Baked breaded chicken breast topped with tomato sauce and mozzarella cheese. Sauteed fresh fish fillet steamed in a white wine, spinach and arugula sauce, topped with toasted almonds, served with mashed potatoes and vegetables. Citrus brushed grilled Fish Fillet with herbed couscous, toasted pine nuts and Gaeta olive puree. Roasted salmon served with fava puree, radish salad and citrus vinaigrette. Large butterfly shrimp prepared on the broiler covered with a lemon and butter sauce with a lemon and butter sauce with puttanesca spaghetti. Prime beef Medallion with arugula, Grana Padano cheese slices and white truffle oil served with rosemary potatoes. Veal cutlets with a creamy white wine sauce, portobello mushrooms and shrimp. Veal ossobuco with risotto, portobello mushrooms and white wine. Charcoal grilled USDA Choice Ribeye (16 oz.) 450 grs. served with Italian style mashed potatoes, butter, lime spinach and asparagus. Vanilla, chocolate or napolitan gelato. Sinfully light sacked pound cake with chocolate, almonds and whipped cream. Classic panna cotta with red fruits. Creme Brulee di Amaretto liqueur with pineapple and toasted almond pastries. Lady fingers, espresso coffee and mascarpone cheese. Vanilla ice cream with Grand Marnier caramel, fresh strawberries fiery almonds. Chocolate crepes stuffed with Baileys chocolate mousse, caramelized orange sauce and fresh berries. Tender mascarpone cheesecake in a chocolate and strawberry coulis. Warm apple tart with cinnamon ice cream. Dark chocolate pudding with fresh cream, vanilla sauce and shaved chocolate. Amaretto, Sambuca, Kalhúa with whipped cream or ice cream. Kahlua & tequila with whipped cream or ice cream. Frangelico & Kahlua with whipped cream or ice cream. Brandy & Kahlua with whipped cream or ice cream. Grand Marnier, Kahlua, Baileys with whipped cream or ice cream. Grand Marnier & Amaretto with whipped cream or ice cream. Vodka, Kahlua, Bailey’s and vanilla ice cream. Amaretto, Kahlúa, Brandy, cream & splash of grenadine. Prosecco il Fresco Rosado DOC Brut Villa S.
Moet & Chandon Rose Ice Imperial Champagne F.
Vodka, lemon juice, and simple syrup . Vodka vainilla, dark crème de cacao, Baileys, milk. Melon, simple syrup, melon liqueur, lime juice and vodka. Vodka, Triple Sec, lime juice and cranberry juice. Vanilla Vodka, Kahlua, dark crème de cacao, espresso. Coconut Rum, blue curacao and pineapple juice. Crown Royal, Triple Sec and cranberry juice. Centinela Clásico, Triple Sec and lime juice. Centinela Añejo, Grand Marnier and lime juice. Gin, Campari, Sweet Vermouth & Splash soda. Centinela Reposado, Galliano & orange juice. Bourbon, Campari & Sweet Vermouth. * All drinks of 45 ml. Marina Vallarta, Puerto Vallarta, Jalisco. Open Monday to Sunday from 12:00 pm to 11:00 pm. Open Monday to Sunday from 2:00 pm to 11:00 pm.